Hello! 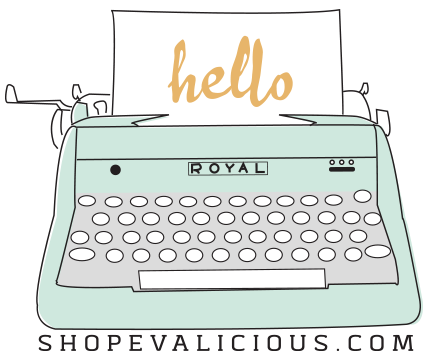 This is Rachel here with you today to share on a creative and fun project I recently embarked on. The Pocket Letter! Some of you may have heard or came across this Pocket Letter thingy on the internet that had set a new wave of excitement in the crafting and pen palling world. Or you yourself are making Pocket Letters and had sent many off to your Pocket Letter Pals. Well hey, I completed my very FIRST Pocket Letter and I wanted to show you just what I had put together and allow me to say this, it was SOOO FUN!! 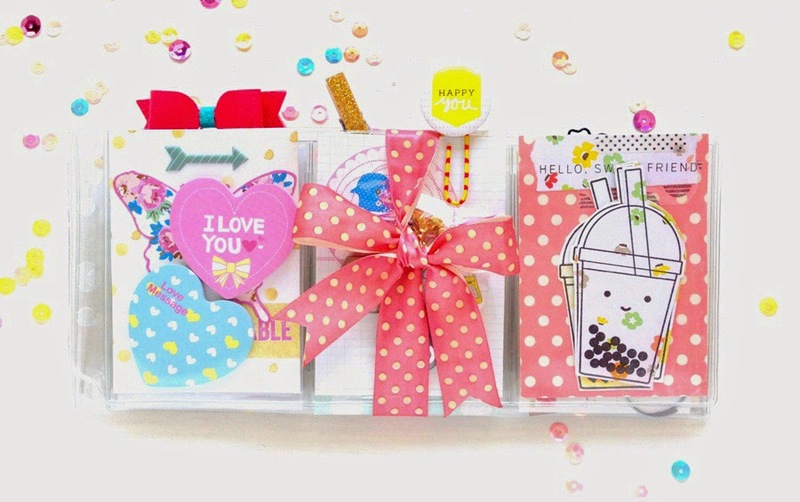 With a 9 pockets trading card protector, I filled each and every pocket with pretty papers and stuffs I wanted to send to my Pocket Letter Pal. Nice little things such as washi tapes, labels, sticky notes, paper clips and most importantly a handwritten letter to my Pocket Letter Pal and tucked it in one of the pocket. 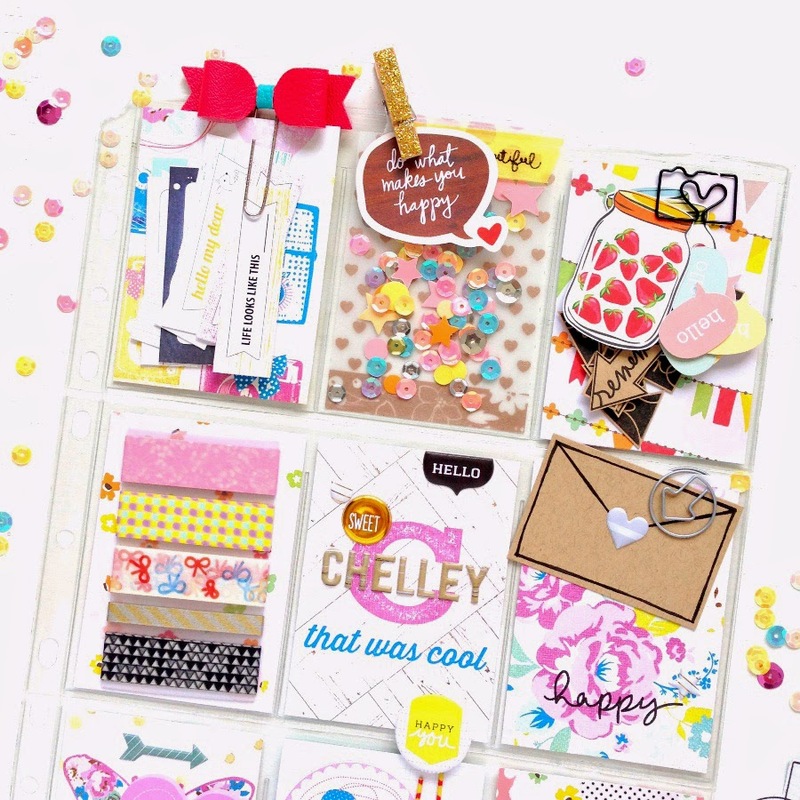 Let me take you through each pocket and show you all the yummy Evalicious goodies I had included for a lovely lady I got to know from the awesome planner community! Left pocket - filled it up with a couple of Evalicious fun labels and clipped the pocket closed with a handmade faux leather paper clip. Middle pocket - used a vellum as a base card and threw in a handful of sequins and confetti. I then sealed the pocket with washi tapes and clipped on a cute speech bubble. Right pocket – filled it with printable, die-cuts and stamped images. Again I used a cute paper clip from Evalicious to close the pocket in order to prevent anything from falling out. Left pocket – tucked in some washi tape samples. Middle pocket – it is the main card decorated with my letter pal’s name with Evalicious alphas and nice puffy stickers. Right pocket – I hand drew an envelope which I clipped it down with Evalicious’s round arrow paper clip. This is the pocket where my letter was slotted in at the back. Left pocket – filled it up with cute sticky notes. Middle pocket – stuffed in a few Evalicious badge buttons and DIY-ed a paper clip with one of them. I included 2 little charms too. Right pocket – this got to be my most favorite pocket out of the rest. 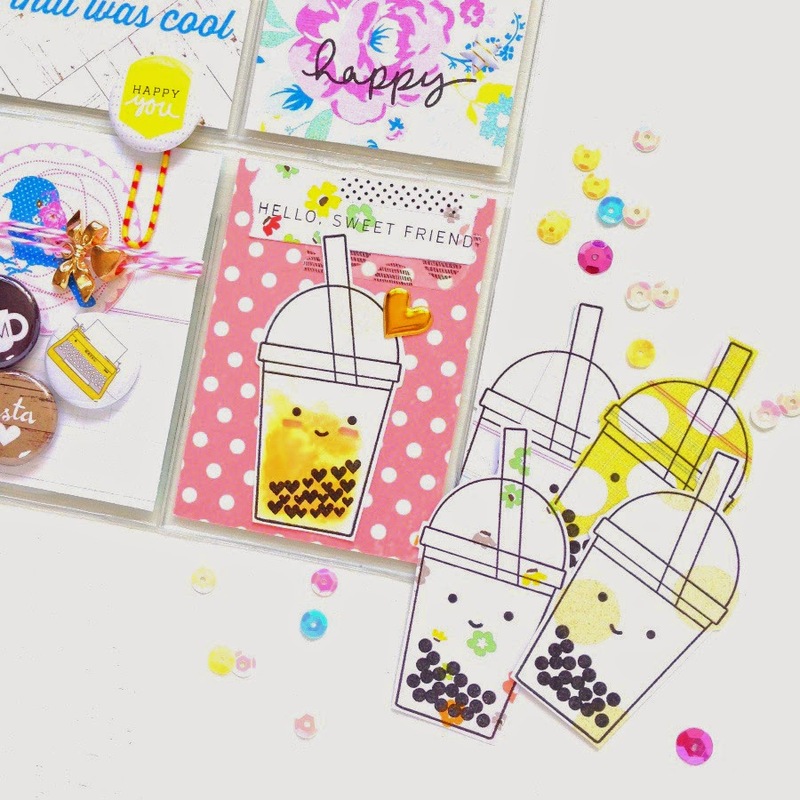 I stamped a few images of the adorable bubble tea from Evalicious latest collection - Addicted To You stamp set on random stash of pattern papers and fussy cut them. One of the bubble tea images was pasted on to the base card and I add-on a touch of watercolour to spice it up. CUTE! The extra bubble tea cut-outs were tucked in to the pocket and I really hope that my lovely friend will find them useful. After this first session of Pocket Letter making, I’m very sure I’ll create many more of them! As for this set of Pocket Letter, it was packed nicely and ready to fly across the big blue ocean to my sweet friend who’s on the other side of the globe! I hope you enjoyed what I shared with you, and thank you so much for stopping by! Your friend is very lucky to be getting this pocket letter. It's gorgeous! Omg! 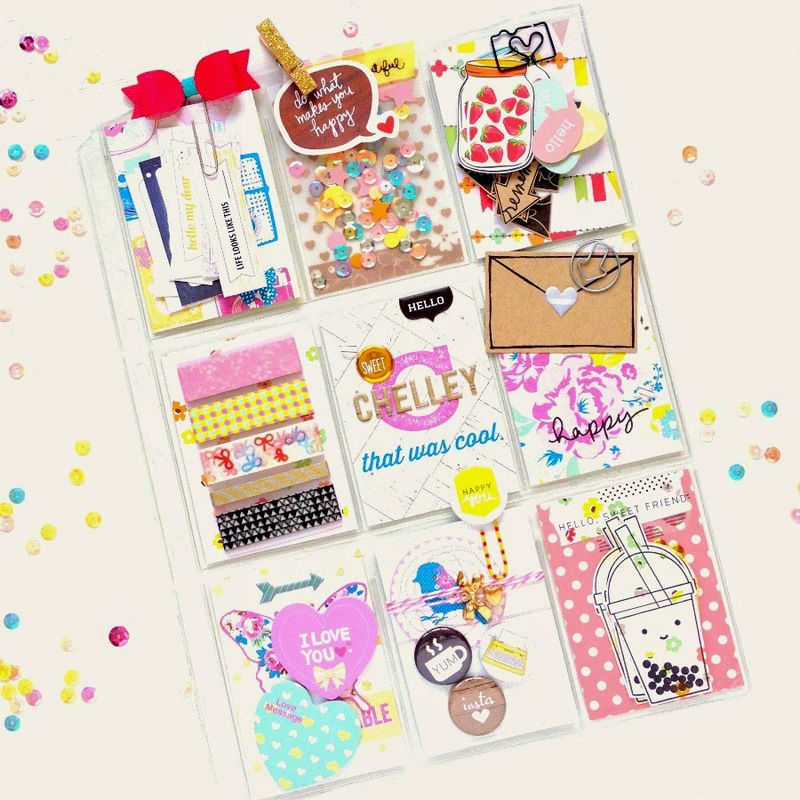 How cute are your pocket letters and your amazing stamps galore?!?! I'm in love!!! So glad I ran across your IG. :) Looking forward to catching up with you! Hi! I love your happy mail pocket letter! It has given me some neat ideas to use in some of mine. I am looking for people to do this with and have also joined some of the groups. If anyone wants to do this with me just let me know. Thank you Rona! I was so glad she adores what I prepared for her.